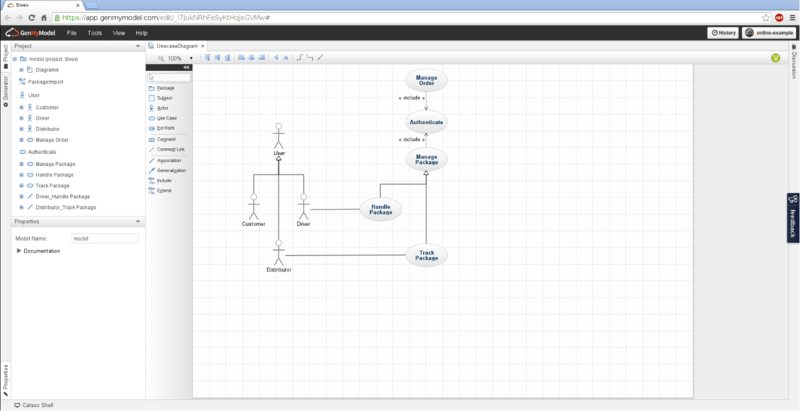 Create use case diagrams in seconds with GenMyModel, a free uml online tool to draw UML diagrams. 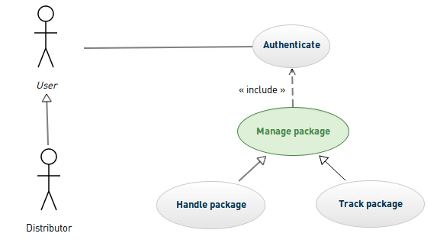 The use case diagram in the Unified Modeling Language (UML) is a type of static structure diagram that represents the user interactions with a system. This diagram portrays the different types of users and the various ways they interact with the system. In UML, the user is called actor and he can be human or an external system. The links between an actor and a use case are called associations. Use cases can be generalized, extended and included. Within GenMyModel, you can create your use case diagram online and generate images and PDF files. Everything is handled in your web-browser with an intuitive user interface. 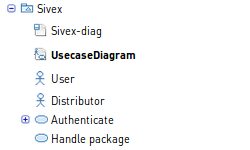 The use case diagrams conform the UML standard. You get both a visual representation, called the diagram, and the internal structure of your model in a tree-based representation. It works on Windows, Mac, Linux and the supported browsers are IE, Chrome, Firefox, Safari and Opera. GenMyModel is an UML editor with powerful features for creating UML use case diagrams, in the web browser. GenMyModel helps you create use case diagrams right away, there's no install, no setup and no learning curve to get started. Actors, use cases, extensions, relationships are created within a click from a user-friendly toolbar and shortcuts. 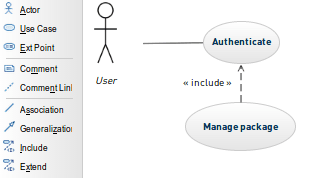 You can draw use case diagrams online in seconds and the intuitive GUI makes it very easy. At anytime, GenMyModel assists you draw valid UML use case diagrams by highlighting the UML elements matching an UML-compliant architecture. It helps you save time for creating UML elements such as extends, includes and extension points. GenMyModel comes with many free examples, clonable within a click. You can access these professionally designed templates from the dashboard area. Click the button below to fork the Online Shopping Cart - Use Case Diagram Example (free). Browse the use case diagram from the project explorer.